This wildflower favours damp shady spots, putting out a formidable network of roots & runners. It has the reputation of being a weed and a nuisance in gardens. 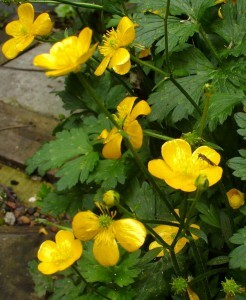 The hairy, lightly spotted leaves of Creeping Buttercup are divided into three lobes with frayed edges. 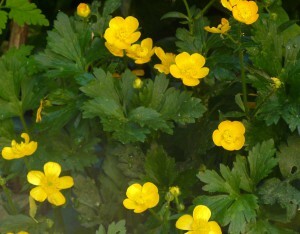 Between May & August, its bright, glossy YELLOW flowers appear. 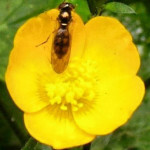 They are pollinated by short-tongued bees attracted by the nectar & pollen. 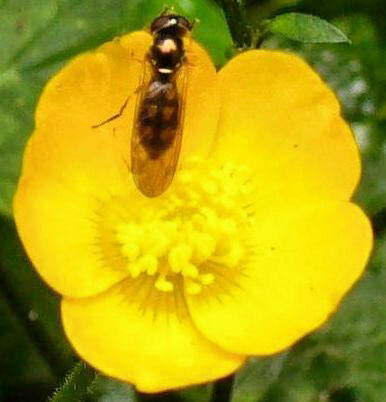 …this golden-cupped flower is a childhood favourite: if a yellow reflection appears when it is held up to the chin, it is considered as a sign that the person likes butter. Ours is a shy and retiring Buttercup. It has grown here against a strip of wood from the old greenhouse for decades, only ever managing a few flowers per season. When moved across the path to the shady border in 2013, it flowered prolifically. In 2014 the neighbouring Ivy had a good year and overgrew the Buttercup. 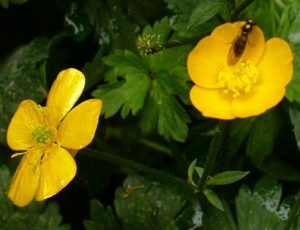 During 2015, only a few morsels of Ranunculus repens remained. Other names: Crazy Moir, Creeping Crowfoot, Devil, Sitfast, Yellow Cups. 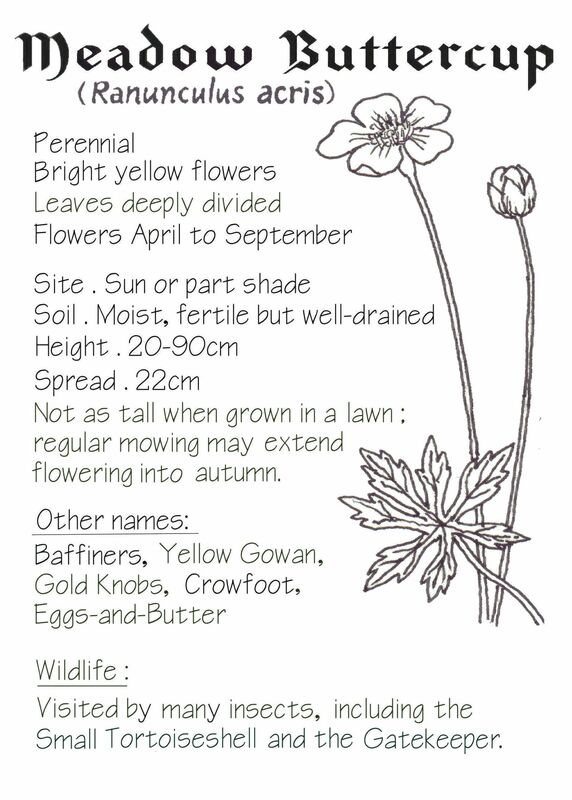 Here at the Highbury Wildlife Garden we also had Meadow Buttercup (Ranunculus acris) for a season. This plant’s flowers are similar to those of our resident Buttercup, but its leaves are deeply divided. 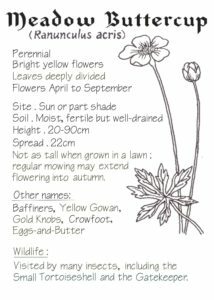 Other names: Gil Cup, Golden Seal, Golden Stands, Goldy, Hop o’ My Thumb, Lady’s Slipper, Tall Buttercup.